From what I've read so far, this sounds like a rather inventive game that Image & Form plans to use to show that not only is SteamWorld a firm franchise, but they as a developer are here to stay as well. This game takes place in the same general world as previous SteamWorld titles but a lot of time has since passed and things have evolved. Here you'll find free-aiming turn-based combat, looting, strategy, and lots of upgrading as the main character Piper makes their way through various locations throughout space. The exact platforms the game will premiere on is unknown but what is known is Image & Form's deep love and appreciation for Nintendo. It's very likely the game will premiere on one or both Nintendo platforms. They intend to bring the game to as many platforms as possible though, staggered over time like how SteamWorld Dig ended up. I don't know about you, but I'm incredibly intrigued. Read the interview at the link below for some very wonderful in-depth information about the title and the direction the developers plan to take it. Developer Interview between Image & Form and Nintendo of Europe UK. @ImageForm Are you guys going to try for a Wii U version? I know sometimes this means all platforms BUT Nintendo, but considering that the last game was on Nintendo platforms, I think we can expect to see this one hit. For sure. They said in the linked interview that they're grateful for Nintendo who helped them establish themselves as a platform and have shown a deep love for them. It's coming to both platforms, the question is just when. Sounds good! I really enjoyed Dig. While I'm definitely interested in Heist, I do wonder if they ever plan on making a Dig 2 at some point. It's in an interview I read on my phone but now can't find to post here. They actually have a timeline in their heads. 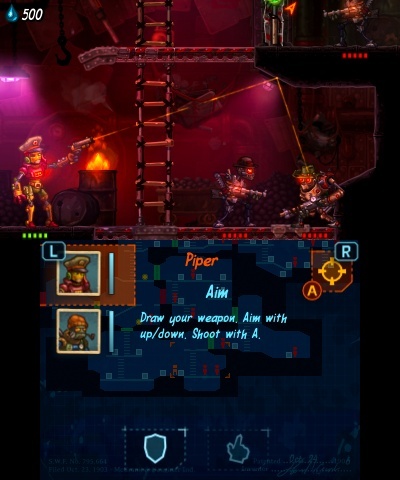 After this they plan to work on the game between SteamWorld Dig and Heist, though if you mean gameplay-wise too, I hope so. They've hinted that with me before through chats on social media. Though I could see them returning to that kind of gameplay a bit after doing whatever the hell they're doing here. Looks amazing, will buy day 1. I dug Dig quite a bit. ALTHOUGH, the idea of them making a Tower Defense game down the line makes me sort of sad. It's not a genre I'm hugely into. It was already released on DSiWare. I'm game. Will nab this on Wii U if possible. I must have missed that! Haha, what a fool I am. It's part of their success story. The tower defense game on DSiware sold way more than they expected, which convinced them to put their ressources into making Dig for the eShop. So this game has been delayed apparently, still no solid release date. It's on my short-list of 2015's most potentially awesome games I hope we get some new info soon! I thought they were just showing this around at events. Was there a 'delay announcement' specifically? Yeah, they posted on their blog it was going to be delayed until at least Fall. Looks like a 2D XCOM without all the randomness. Sounds good to me. This looks really cool. I'm liking the sound effects such as the robotic voices and the clanking of metal that is audible in the gameplay trailer.